On Monday, the United States reimposed oil and financial sanctions on Iran that the Obama administration had lifted as part of the JCPOA in order to incentivize Iran to completely abandon its nuclear program. Secretary of State Mike Pompeo vowed that the United States will not back down until Iran has completely abandoned the program: “The Iranian regime has a choice: it can either do a 180-degree turn from its outlaw course of action and act like a normal country or it can see its economy crumble… we will be relentless in exerting pressure on the regime.” Washington’s decision has sparked defiance and anger in Tehran. Iranian President Hassan Rouhani has declared that Iran has no intention of complying with the sanctions and plans to continue selling oil regardless of the United States’ demands. At a rally marking the anniversary of the 1979 Iranian seizure of the American embassy that drew a crowd of thousands, Major General Mohammad Ali Jafari addressed President Trump directly: “Never threaten Iran, because we can still hear the horrified cries of your soldiers in the [desert] … and you know it better, how many of your old soldiers in American society commit suicide every day because of depression and fear that they suffered in battlefields.” However, although Iranian officials have taken an optimistic tone, the Iranian economy is currently suffering from a massively devalued currency and a sharp decrease in oil exports. 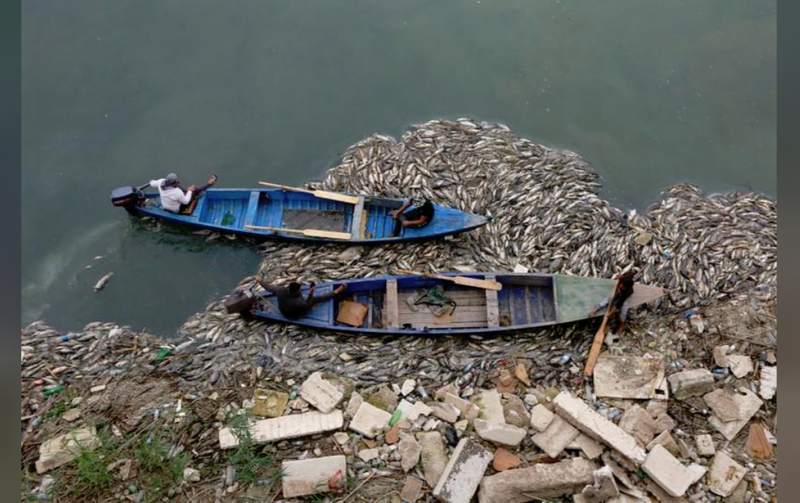 Thousands of tons of freshwater carp have turned up dead along the Iraqi banks of the Euphrates, badly hurting the fishermen who rely on the fish for their livelihood. The cause of the deaths are unknown, but it may be part of a larger Iraqi water pollution crisis. Freshwater carp is considered a national delicacy in Iraq. One fish farm owner, Mohammed Ali Hamza Al-Jumaili, told Reuters that the whole year’s effort and a year’s worth of workers’ wages was now wasted. Al-Jumaili appealed to the government for help: “We call on the government to compensate all the fish farmers, whether those who have officially-licensed farms or those who do not, to enable them to continue fish production.” The agriculture ministry blamed the losses on diseases spreading easily in the tight quarters of the breeding cages and on reduced water in the Euphrates. On Friday, the Trump administration announced that it will end the practice of refueling Saudi-coalition aircraft, halting the most tangible and controversial aspect of U.S. support for the kingdom’s three-year war in Yemen. The move comes amid escalating criticism of Saudi Arabia’s conduct in the war. Lawmakers from both parties have demanded that the United States suspend weapons sales to Riyadh and cut off aerial refueling of aircraft flown by the Saudi-led coalition. Secretary of Defense Jim Mattis confirmed the decision in a statement saying “we support the decision by the Kingdom of Saudi Arabia, after consultations with the U.S. Government, to use the Coalition’s own military capabilities to conduct inflight refueling in support of its operations in Yemen.” The Saudi Press Agency said the coalition, led by Riyadh and including a number of mostly Arab nations, had “requested cessation” of the refueling due to its own increasing ability. Analysts said the move is likely to affect Saudi Arabia’s ability to conduct bombing missions. The United Arab Emirates has launched a National Festival of Tolerance, which will run until November 16 and include 100 events designed to raise public awareness about acceptance and understanding. The inaugural National Festival of Tolerance kicked off on Friday with the 2 km Walk of Tolerance in Abu Dhabi. It was the first of many events planned to promote the mission of the Ministry of Tolerance. “The main aim of this program is to encourage and qualify all categories and individuals of our community to utilize their potential in spreading the values of tolerance, respect, coexistence and harmony among all UAE citizens and residents to achieve happiness and prosperity for all,” said Sheikh Nahyan bin Mubarak, the UAE’s Minister of Tolerance. In related harmonious news, the UAE was named the world’s second safest place to visit, beating countries including Singapore, the United States and popular European destinations, according to Which?, a British consumer advocacy nonprofit organization. The report ranked the world’s top 20 holiday destinations using data collated by the World Economic Fund, the World Risk Report, NHS Fit for Travel website and the UK Foreign and Commonwealth Office’s (FCO) terrorism assessment risk to assess their overall safety. Iceland earned the top spot but the study noted that parts of the Middle East and North Africa are safer by a range of measures than some more popular holiday destinations. Jordan has a lower risk of crime than France, Italy, the U.S. and Thailand, while Morocco has less crime and a lower risk of terrorism than most of Europe and the U.S.